Here’s an interesting guest post from friend Mike Laser on how he teaches sentences in mini-lessons–even within a constrained syllabus that he can’t alter. Every freshman composition instructor knows how hard it is to elicit graceful sentences from awkward writers. But not all of us have the freedom to do that. The university where I teach has some core requirements for its freshman writing classes—an understandable quality-control measure when you offer more than a hundred sections, taught mainly by adjuncts. The curriculum leaves no room for eight weeks of preliminary skill-building. My students are required to write three essays in each fourteen-week semester, three drafts per essay. We start work on their first essay by Week Three. Though I can’t design my own curriculum, I’ve found a way to build sentence skills into my teaching. Each class meeting includes a lesson in one of the skills I think will make the biggest difference to my students. If you visit my website, collegewritingclinic.com, you can see the skills I teach and the basic strategy I use—which borrows some key ideas from John. • On Day One, I talk to students about why they should put serious effort into this class, even if English is their least favorite subject. This is more important than it may sound. Unless they care enough to work at it, they’ll make little progress. • Also during that first class, I show them a few terrible sentences written by past students and ask what they think. Then I show them edited versions of the same sentences. With this evidence in front of them, they begin to recognize that some sentences desperately need revising—and that it’s possible to fix even the worst clunker. • Over the course of the semester, I teach a few strategies for improving problem sentences, and some simple ways to write more clearly and gracefully. • I also show them some common mistakes in grammar and punctuation, and train them to avoid making these mistakes. • They practice each new skill as they learn it, by writing sentences that use the concept. • We discuss the text they read for homework. • I teach a lesson on a sentence skill. • I ask them to express the main idea of their in-class writing in one polished, grammatically correct sentence—using the skill they just learned. • Once they’re satisfied with their sentences, students post them on Padlet, a website that lets the whole class see what each student has written (anonymously, if they prefer). I point out sentences I consider especially good, and explain why. • I also teach a lesson on a key essay-writing skill in every class—for example, refining a thesis, or addressing opposing arguments. Clearly, students would make more progress if we had more time to spend on sentence skills. But this method has yielded much better results than anything I tried before. I hope you’ll visit collegewritingclinic.com to learn more. 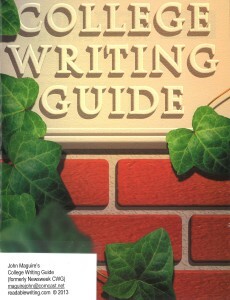 If you’d like to use my lesson plans and handouts, they’re included in my book, The College Writing Clinic, which is available on Amazon and BarnesandNoble.com, in print and digital formats.